﻿ "body weight and fertility"
Abnormalities of body weight can have dramatic effects on ovulation. 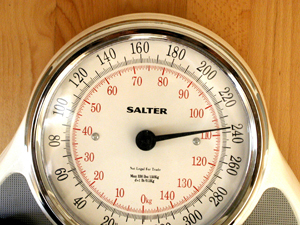 A normal body mass index (check your BMI) is between 18.5 and 24.9. Low body weight, particularly when combined with stress, can cause menses and ovulation to stop due to suppression of the hormones normally activating the ovaries. On the other end of the scale, excess weight can cause menses and ovulation to cease due to the many complex effects of the extra weight, including increased levels of insulin. In both of these instances, ovulation and normal fertility can often be achieved just by normalizing your weight. In fact for women with excess weight, ovulation and pregnancy may occur by losing as little as 10% of your current weight, without getting back down to a fully normal weight. The chance of suffering a stillbirth for obese women was two-fold higher*. You can see from these results that as weight increases the chance of a successful birth progressively falls. The most prominent effect occurs when the BMI is over 35, when women are fully a third less likely to achieve a live birth. Even with a successful birth, the odds of delivering before 32 weeks, which is quite premature, increases by over 25% when the BMI is over 30 and by over 50% when the BMI is over 35. Such early delivery can lead to a marked increase of the chance of the newborn not surviving or having very significant health problems or permanent handicaps. For reasons that are not understood, these effects are greater in non-white (Asian, Latino and African-American) compared to white women (Luke 2011b). The chance of failing to give birth was 86% higher in non-white compared to white women who are obese. For prematurity, African-American women are at even greater risk, particularly with multiple pregnancy. Weight control is therefore particularly important in all non-white women having IVF. Excess weight is a factor that should be attended to when you first start to attempt conception. If you do a brisk 30 minute walk every day and eliminate 200 calories from your food intake, you will lose 30 pounds per year. 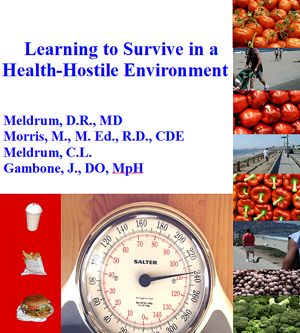 Below you can download “Learning to survive in a health-hostile environment” and it will have many helpful hints regarding weight control. If you do require fertility treatments your chance of success will be higher. By the time you might need IVF you will have lost 60-90 pounds and your success rate will be maximized. Your pregnancy will be less complicated and your health will be better for many years to come. Do not try to lose weight while you are pregnant. 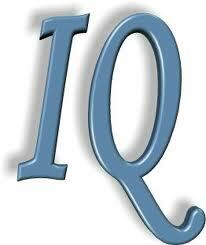 That could result in poor growth of your baby and even a loss of I.Q. points. However, women who are overweight can gain less weight during pregnancy than women who have a normal weight, without adversely affecting the offspring. Current guidelies are given in Appendix E of the book below but you should ask your OB how much weight you should gain based on your pre-pregnancy weight. You must not be on a high protein diet when attempting to conceive. A high protein diet has been correlated with decreased fertility in animal studies (Janesch, 2009). The higher concentration of ammonia found in reproductive tissue may inhibit embryo development and cause abnormal gene function. "Learning to live in a health-hostile environment"